Group of five members of the United States Congress, includes: KENNEDY, “Teddy” Edward Moore (1932-2009) was an American politician who served in the United States Senate from Massachusetts for almost 47 years, from 1962 until his death in 2009. Inscribed Signed Photograph “To Judge H. John Lobe with my best wishes Ted Kennedy 1971.” 8”x10” black and white. Framed. With transmittal letter. Fine condition...plus; WRIGHT, Jr. , James Claude (1922-2015), usually known as Jim Wright, was an American politician who served as the 48th Speaker of the United States House of Representatives from 1987 to 1989. He represented Texas' 12th congressional district as a Democrat from 1955 to 1989. Inscribed Signed Photograph “With very best wishes - Jim Wright.” 8”x10” black and white. Fine condition....plus; MUSKIE, Edmund Sixtus (1914-1996) was an American statesman and political leader who served as the 58th United States Secretary of State under President Jimmy Carter, a United States Senator from Maine from 1959 to 1980, the 64th Governor of Maine from 1955 to 1959, a member of the Maine House of Representatives from 1946 to 1951, and the Democratic Party's candidate for Vice President of the United States in the 1968 election. Inscribed Signed Photograph “With best wishes Ed Muskie” 8”x10” black and white. Framed. Fine condition...plus; JACKSON, Henry Martin "Scoop" (1912-1983) was an American politician who served as a U.S. Representative (1941–1953) and U.S. Senator (1953–1983) from the state of Washington. A Cold War liberal and anti-Communist Democrat, Jackson supported higher military spending and a hard line against the Soviet Union, while also supporting social welfare programs, civil rights, and labor unions. Inscribed Signed Photograph “To Judge John Lobe with best wishes Henry M. Jackson. 8”x10” black and white. Framed. 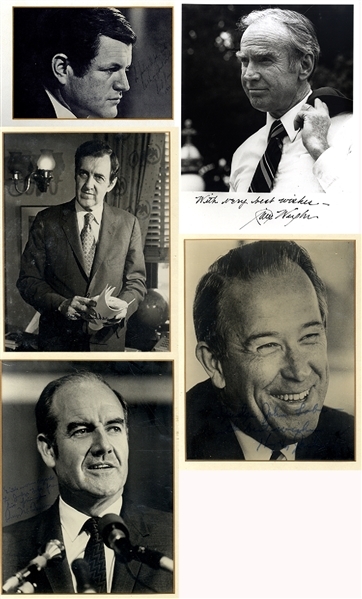 Fine condition...plus; McGOVERN, George Stanley (1922-2012) was an American historian, author, U.S. representative, U.S. senator, and the Democratic Party presidential nominee in the 1972 presidential election. Inscribed Signed Photograph “Withe warm regards to Judge Lobe from his friend George McGovern.” 8”x10 black and white. Framed. Fine condition.